Every occasion demands something new and trendy to carry around. The glam and gleam of a good dress can do wonders to your outlook. 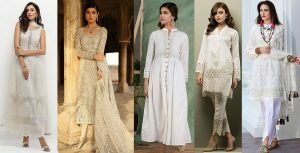 Formal and party wear couture trends are swiftly changing with the wind as distinct cuts, alluring embroideries and anything out of the box is loved by all. This is the reason that we bring you all the inspiring new collections by super creative designers and revolutionary clothing lines. 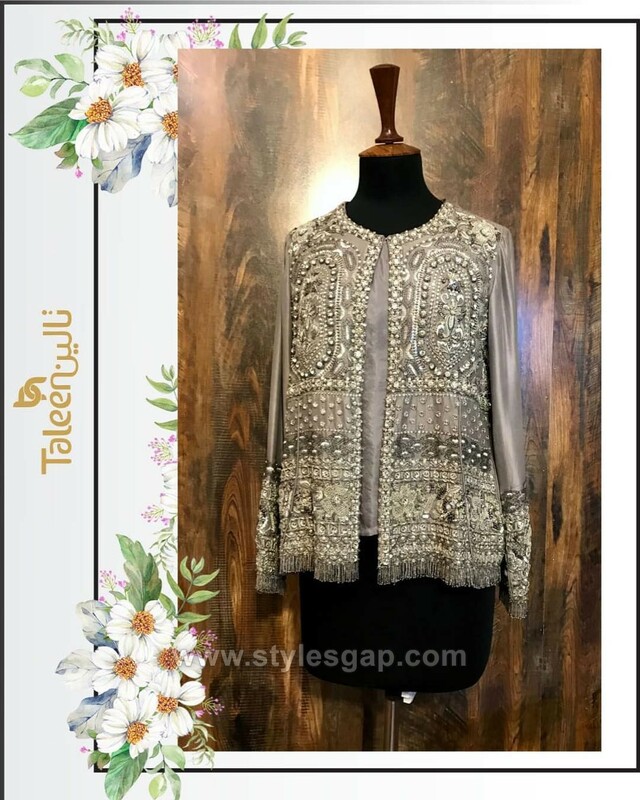 Taleen by Hamza Siddique is one such name which has stepped into Pakistan style industry with the single aim of innovating and revolutionizing the clothing trends altogether. It’s not just the epic hues or the appealing cuts and stitches, but the embroideries will too captivate your mind and soul with the sheer simplicity and novelty the brand has brought forward. 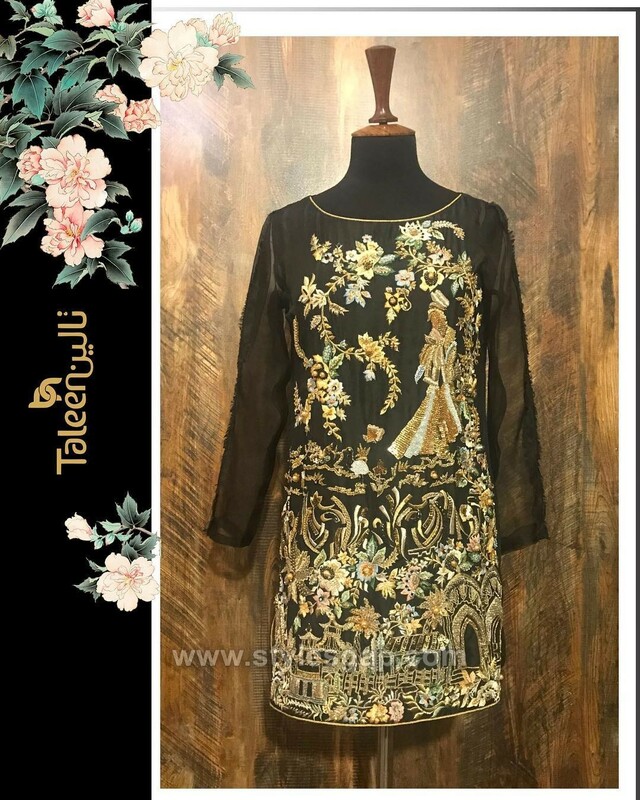 Let’s have a look at the Latest Formal Party Wear Dresses Collection by the brand Taleen. 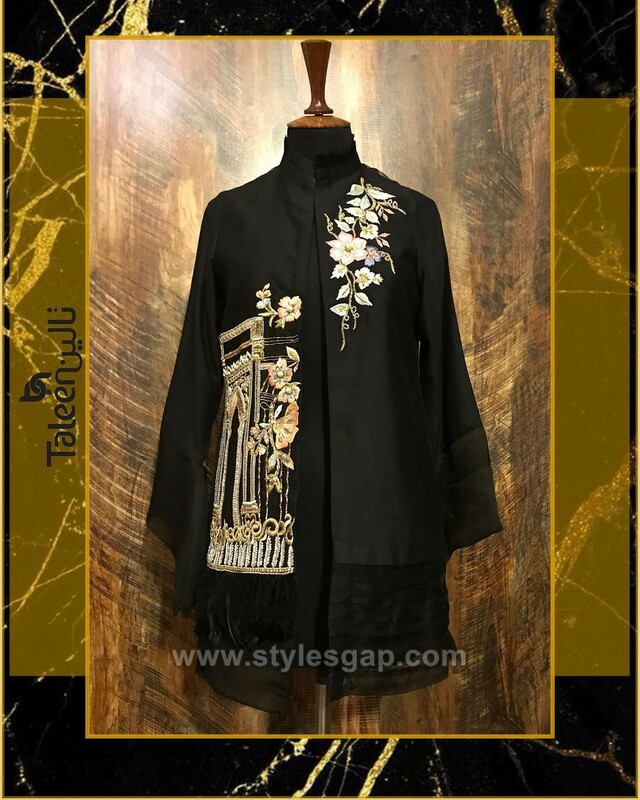 Crafted in black silk and organza the dress has layers of colorful embroideries which are embossed over the front panel of the shirt. 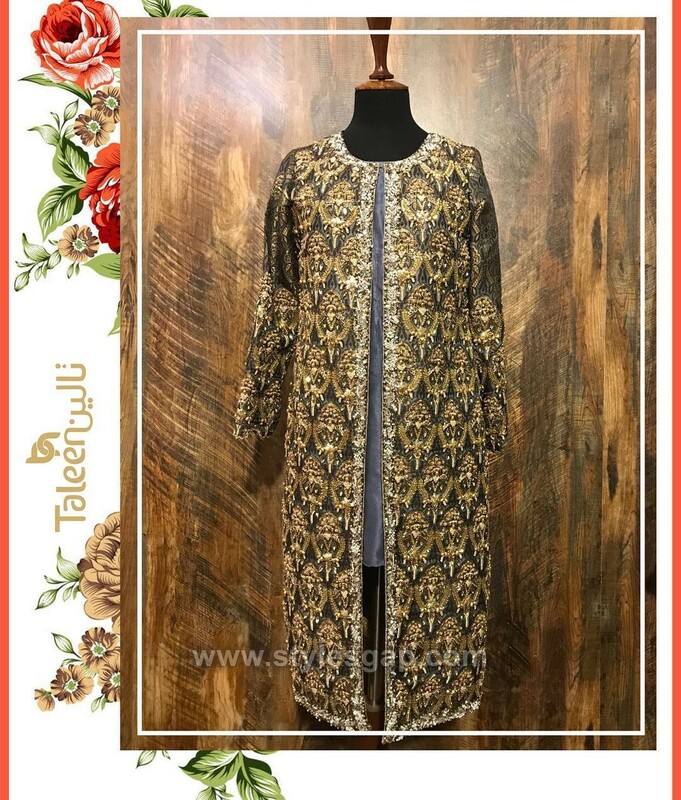 If the embellishments aren’t enough to amaze you than the innovative use of the furs and feathers on the sleeves, the hanging tassels and trendy trouser will move your heart. This dress is perfect for all sorts of formal dinners, parties and house functions. The black itself has such an appealing glare which is enhanced by the addition of multihued embroideries. 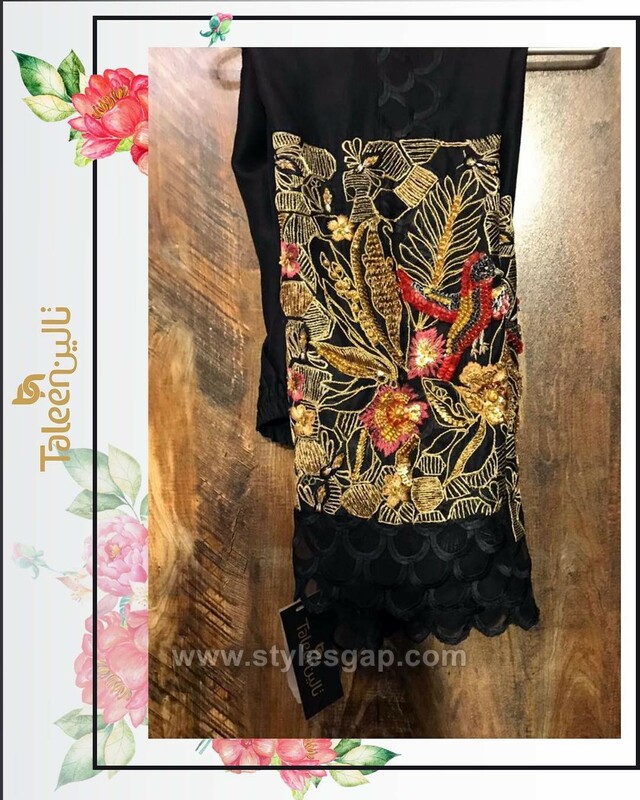 You might have seen a number of high- and low-end dresses, but this one is entirely unique in the use of such design. 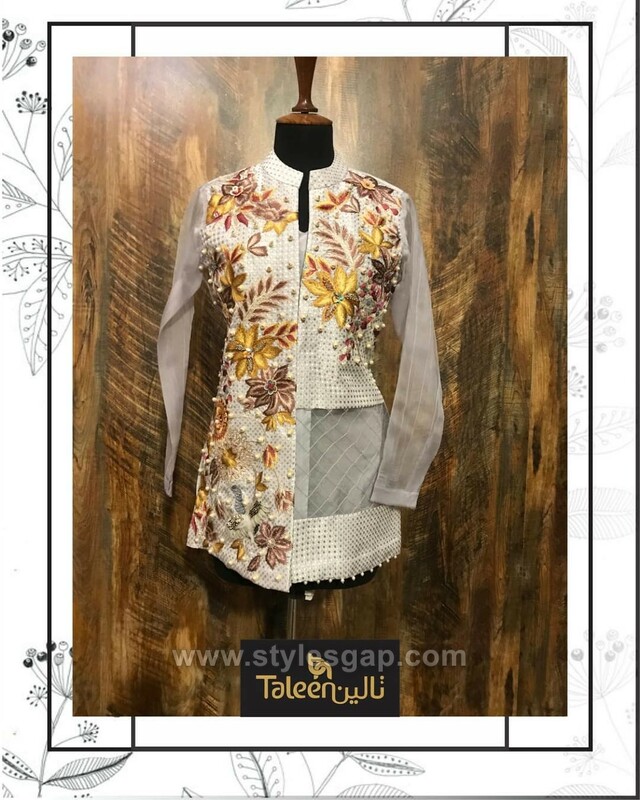 The two sides of the shirt do not differ in length but also in the use of embellishments and the types of the motifs crafted on them. This sharp contrast in the cuts makes this apparel a must have for a trendy super cool outlook. 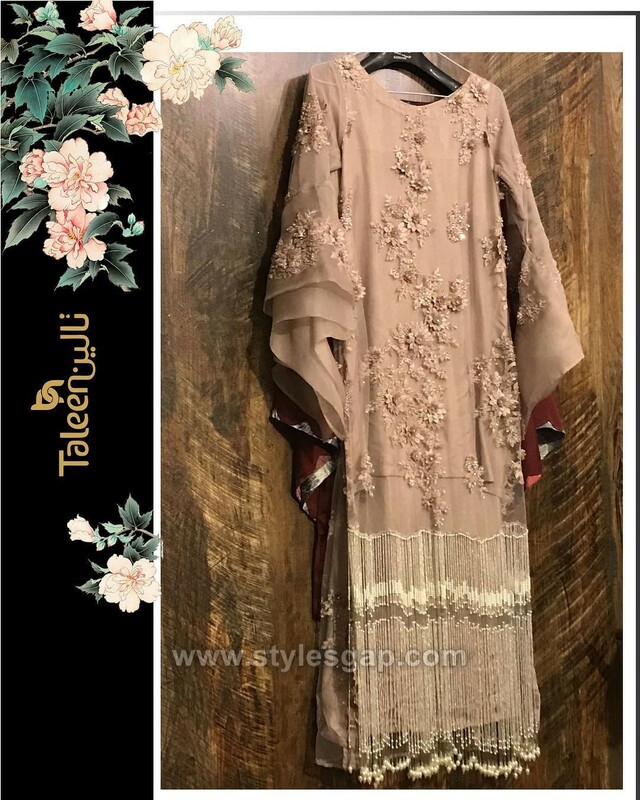 Next comes another marvel from the house of Taleen. 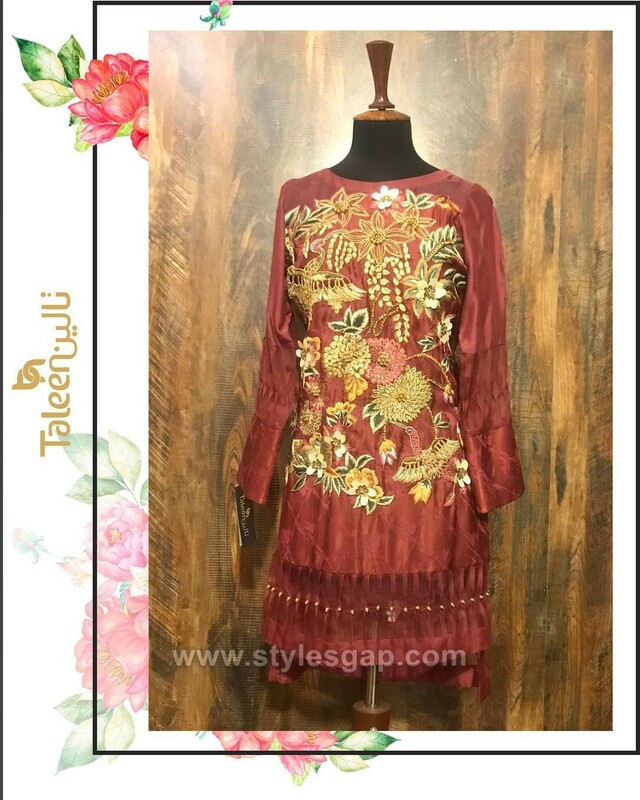 A maroon embroidered shirt designed using silk and organza with a simple neckline and high low baseline. It is somewhat a color variation of the first apparel discussed here. 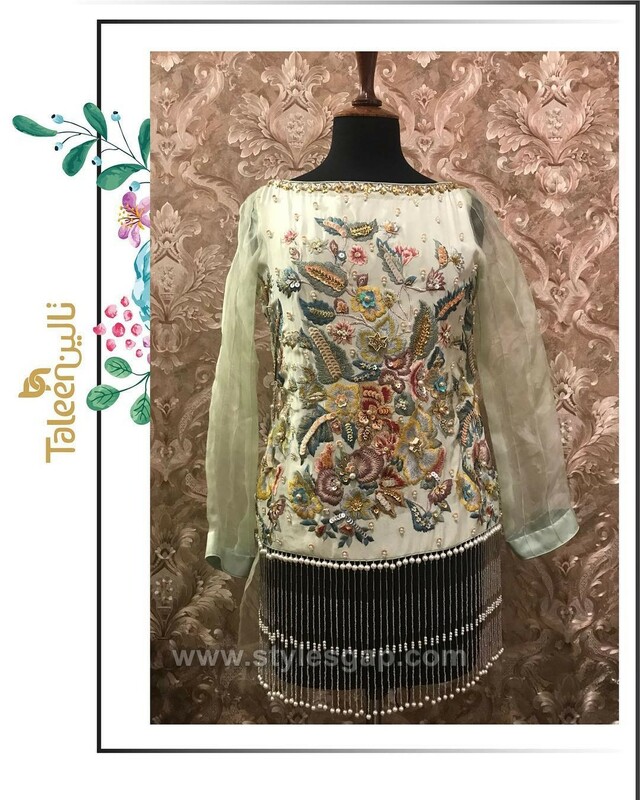 So, the embroideries are kept in accordance with the base color, meaning in bronze and ivory, so the work is tastefully highlighted on the front of the shirt. The all embossed work stands out due to its form and color. Upper jacket style dresses have been in style for quite some time now, and they are not going away any time soon. It’s the simplicity and elegance of such dresses which turn our hearts and eyes back to the style. 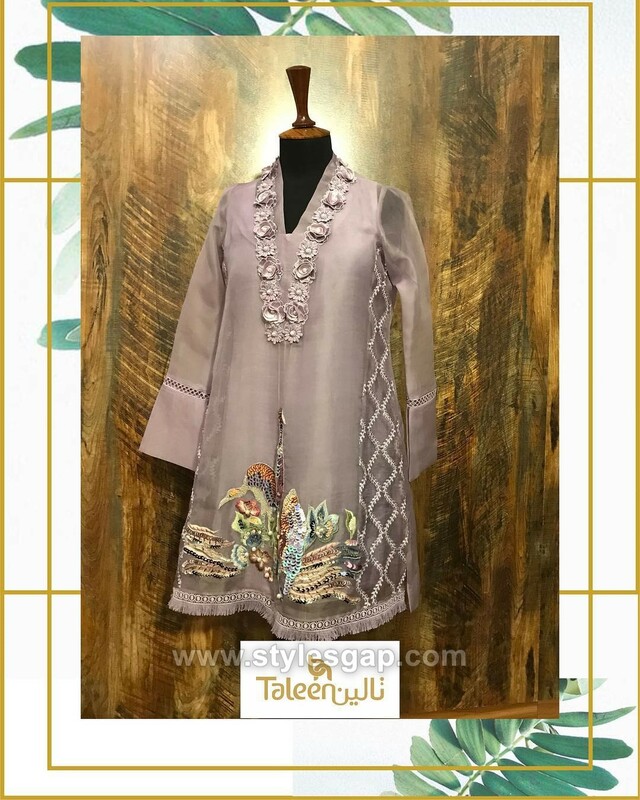 This dress too is crafted in original upper style with a plain and simple inner lining and bottom along with a well embroidered upper shirt. Here too the designer made excellent use of silk and organza in both the upper and the inner. This grey-blue tone is serving its purpose with the use of such fascinating embroideries. The traditional patterns are crafted with such a balance and harmony that it all plays well together. The shirt simple with decent cuts and neckline. Embroideries are more focused around the neckline, sleeves and the base. Dotted patterns extend the entire length of the shirt. The bottom is purely simple which is rightly complementing the shirt. The dress a perfect duo in a single shirt. Without the use of any prominent color, the designer has creatively crafted the shirt best suited for formal wear. Self-imbedded lacework covers the one half of the shirt whereas the other side is entirely plain. So, in a way, both sides are balancing one another along with their high low ends. If you are looking for something soft and mellow to carry around on a special occasion, then this dress is the one. 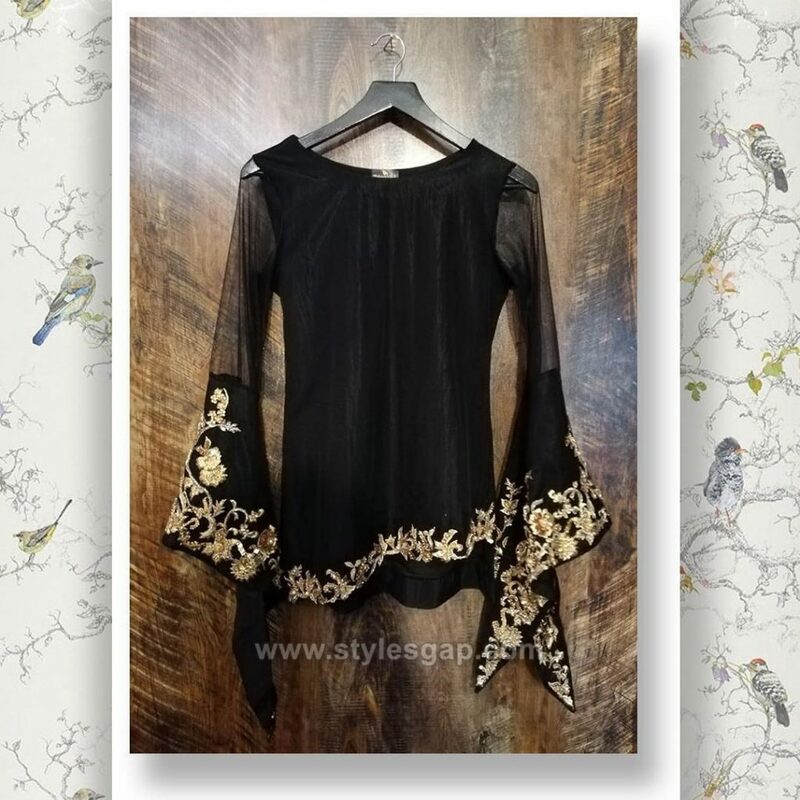 This black chiffon top is made mesmerizing due to the sharp use of golden embroideries. Its light and comfy to carry around to all the formal and seasonal occasions. To pair it with a decent bottom is a real task. Anything simple and plain would go with this top. It has embroideries lining the sleeves and the base of the shirt. Such a great use of contrasting embroideries in blue is making this top something irresistible. It is designed in chiffon which makes suitable for all the seasons. 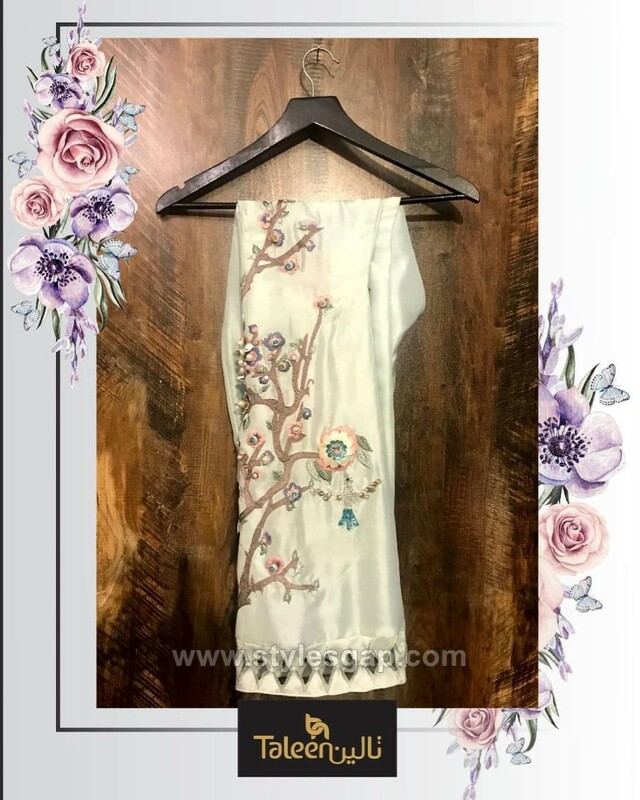 It has a distinct touch of embellishments as they portray archetypal motifs connected together. Sleeves to are embroidered around the front flares which looks exquisite. 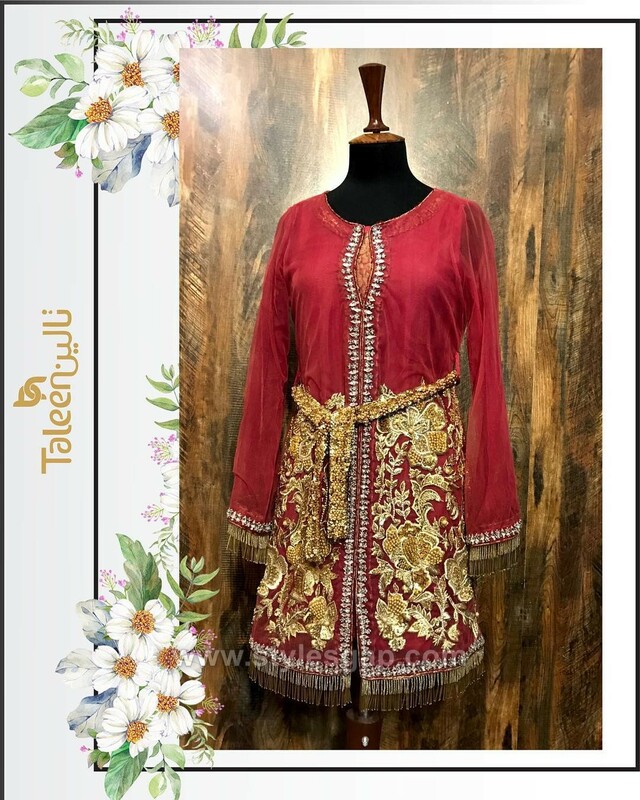 With greatly embellishment dresses and tops, Taleen also endeavored to produce a range of matching stylish bottoms. These bottoms are crafted with delicate lacework around the ankles. Available in creamy white these bottoms can be paired with any of the formal tops. These straight pants trouser not only looks stylish but also trendy. 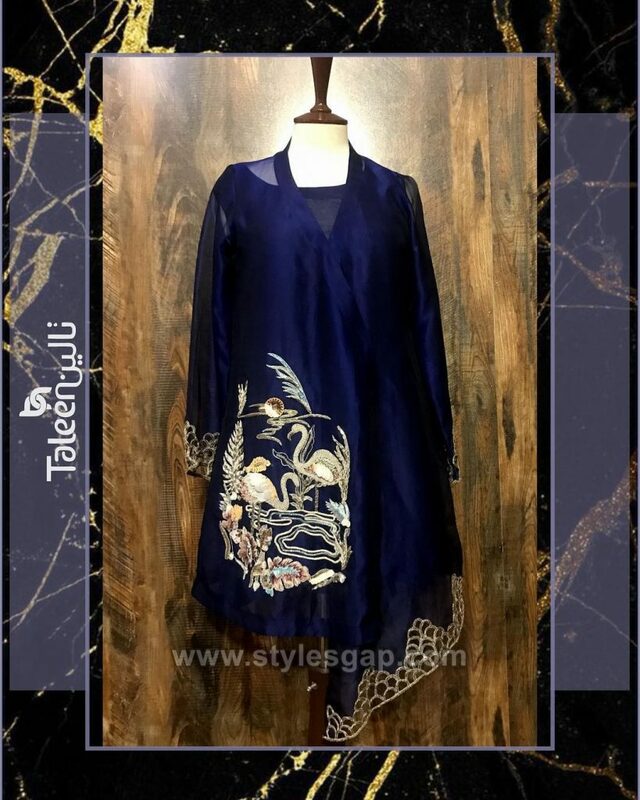 This silk blue top is something quite precious to keep in your wardrobe for this season. 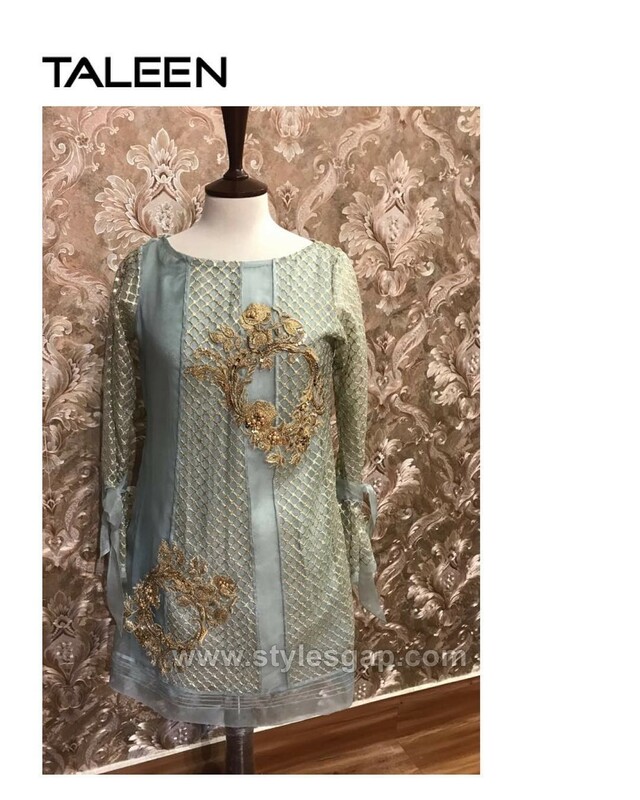 It also has the signature high and low Taleen style. Along with sharp cuts, visible applique work in ivory and white is highlighting the baseline. Sleeves are lightly embellished to balance the prominent peacock motifs. Pair it with a plain trouser and are good to go. 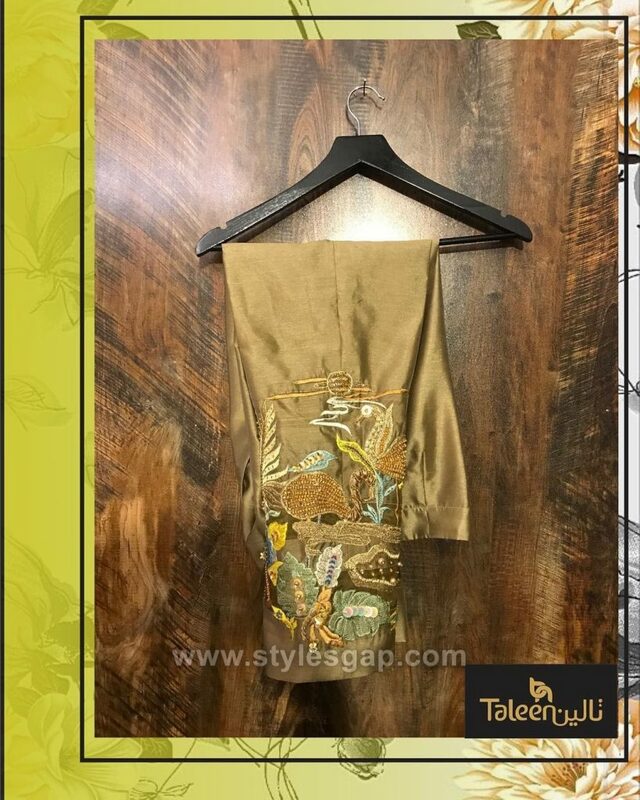 This straight silk trouser in mild gold is perfectly designed with loads of applique work in ivory, greens, and blues. The shiny work sparkle enough to captivate the mind and soul. This trouser can go with any top in darker shades. The best option is to complement the midnight bloom shirt with this trouser, and it will look amazing. The embroideries used on this shirt are extraordinary. It’s a loose cut full-length shirt with loads of fringes at the end. 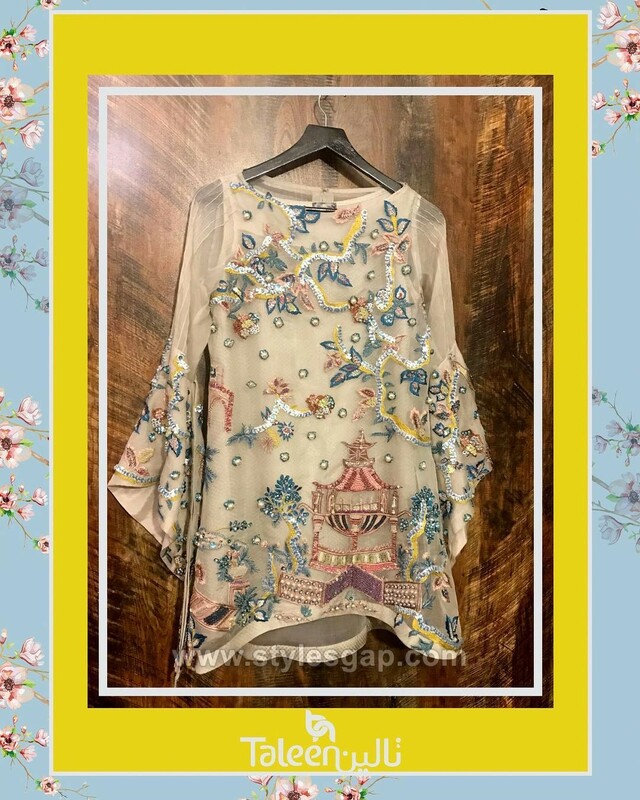 Embossed flowers along with pearls, all in beige looks mesmerizing. This double layered chiffon dress is best for wedding functions and suits to any theme. Its mild color is good for an ultra-elegant outlook. That’s right; high neck tops are back in the trend. Its black in cotton silk with the minimal use of organza around the sleeves and the baseline. The front slit style is something adding novelty to the top. Moreover, the use of applique and thread work in ivory is simply phenomenal. Such a calming effect this dress is bringing to the eyes due to the brightest shade of white silver. 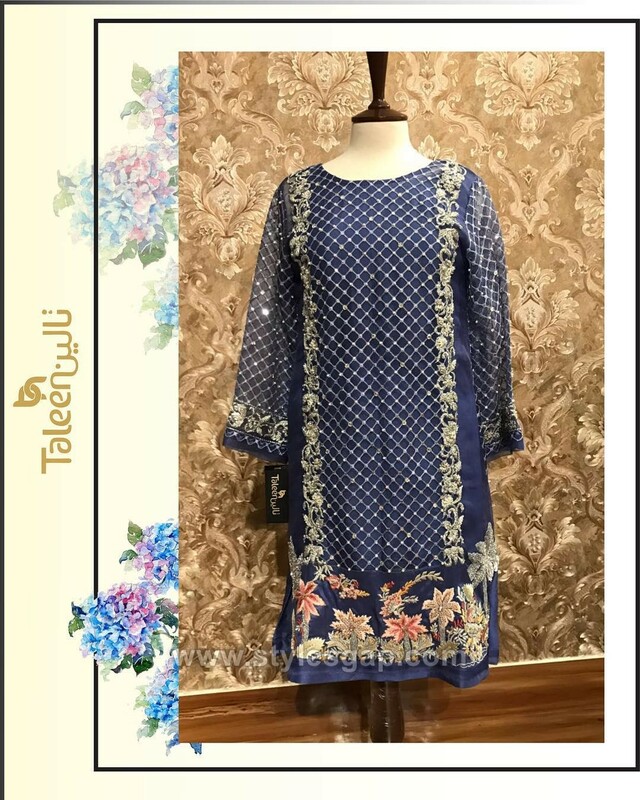 It is crafted with lots of lacework in sleeves and the bottom. Threadwork also extends across the side panels. A unique piece of pearl strand with a prominent brooch on the front is Taleen’s one of the signature styles.